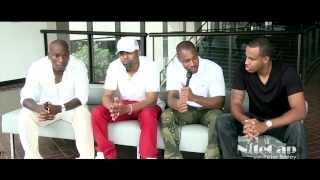 Tyrese, Ginuwine & Tank: "R&B is Losing Its Place In The Mainstream"
This guys are the best! Authentic true black warrior will show up... Ok then Lmao! im ready to get moist between my legs. i agree there are artist who sing to woman and we want the same thing and thats a man. so boy i hope them wetdreams i be having about Tank that i hope he aint gay or bi. IJS that kill my spirit. Music is a healing......What would the world be with out music? Dope but this should've been longer! It's a lot of wisdom they didn't get to share.